The Opening Mass of the 2006 General Chapter was celebrated in the Basilica of Sts. John and Paul. It was the wish of St Paul of the Cross to have a house in Rome in order to have a sense of ecclesial unity and also to facilitate official relations with the Holy See. In 1747 the possibility of acquiring the church of San Tommaso in Formis in the Villa Celimontana together with the former residence of the Trinitarians seemed to be a reality. However the opposition of the Canons of St Peter, who had jurisdiction over this property, blocked the project. On 9th January 1767 he was able to take up residence in a house of the Ospizio del SS Crocifisso on the wide Via San Giovanni that was bought from the Jesuits. Approximately seven to nine persons could be accommodated in this dwelling. On 21 July 1773, the Jesuits were suppressed and on 9th August 1773 a commission was established by the Cardinal to settle their properties. A member of the commission was Cardinal De Zelada, a close friend of Paul. He suggested to Paul that he request the church and the monastery of Sts John and Paul on the Celio which was located in open country and which was more in keeping with the spirit of solitude of the Congregation. The Vincentians, who since 1697 were living in this complex on the Celio, would be offered the church of Sant’Andrea on the Quirinale together with its residence, thus offering them greater possibility for ministerial activity. Due to the support of Pope Clement XIV, an agreement was reached and on 7th December 1773 the Vincentians left the monastery on the Celio and several Passionists quietly took possession of the complex. On the afternoon of 9th December 1773, St Paul of the Cross together with the community of the Hospice of the Holy Crucifix entered Sts John and Paul. The Te Deum was sung in the basilica before the Blessed Sacrament in exposition and the religious immediately began their prayer, night and day, for the Church. The church that the Passionists found was built above the houses of the martyrs John and Paul, who were martyred there in 362 during the persecution of the emperor Julian the apostate. The church was erected by the senator Pammachius and was completed toward the year 392 AD. The original monastery that the Passionists found when they arrived is located in the area of the room used by St Paul of the Cross and dates to the 18th century. The Passionist religious were located in the wing off the main entrance and in the corridor leading to the refectory, which ended in the present day retreatants’ refectory. There was no third floor of rooms. The choir of the community was formed from the façade of the basilica above the portico of the main entrance. Therefore at least six times every day the community passed by the room of the Founder in order to get to the choir. The Founder resided in this room where he died because he could no longer walk and it would have been difficult for him to climb the steps to the first floor where the rooms of the religious were located. Across from the room of the Founder were two bedrooms where two religious resided. 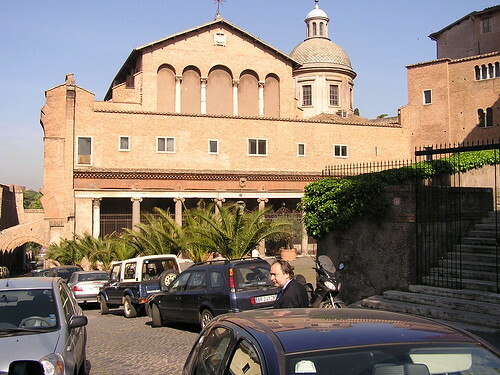 In addition to being the site of the General Curia, the student theologate was also located here. The Vincentians used to give retreats here for seminarians and priests and the Passionists continued to set aside the second floor of the house for this same purpose. The retreat movement gradually developed. In 1798 the community experienced the first occupation by the French and they were forced to house the military and their families in the monastery. In 1810 a general suppression of religious organizations was decreed by Napoleon and only a custodian of the basilica was allowed to remain. The monastery was completely stripped of its contents. When Napoleon was defeated and the Pope was released from prison, the religious returned to Rome in May and through the mediation of Cardinal Litta, a friend of St. Vincent Maria Strambi, on 26th June 1814 the Passionists obtained permission from the Pope to once again live in community. On 10th July 1814 at Sts. John and Paul the religious that were dispersed throughout Rome and in nearby areas reunited and resumed wearing the religious habit and living in community. When they returned the religious found nothing remaining in the monastery: no chairs, tables or beds. The community continued to function as a student center and as a retreat center of spirituality for priests and laity. At the time of the political unification of Italy the new government suppressed religious institutes, including the community of Rome which, according to the law of 19th June 1873, was also suppressed. The Superior General, Fr. Domenico Giacchini, asked the Cardinal Vicar to request permission of the Ruling Council to use the house of Sts. John and Paul for retreats for the clergy as had always been the custom. Influential persons who were well-known in the government as well as by the General of the Passionists also spoke in favor of this request. On 30th June 1875 the minister of Mercy and Justice announced that the Ruling Council had promulgated a decree of dissolution of the community of Sts. John and Paul and on 1st July 1875 it consigned the establishment with its garden to the Cardinal Vicar. He assumed the responsibility for its maintenance and he allowed the then Superior General and his Curia to live there as the superior of an international Congregation. Thus, the Passionist community was able to remain in the monastery although in very precarious circumstances. Legally, until 1929, the property belonged to the Cardinal Vicar; in that year by means of an agreement with the Holy See, the monastery of Sts. John and Paul and its garden were included in the Lateran Concordat through the kindness of Cardinal Gasparri, a great friend of the Passionists. He obtained permission from Pope Pius IX to have the monastery and the garden declared extraterritorial property. The major work undertaken by the Passionists are as follows: the large sacristy inaugurated in 1860 (the sacristy during the time of St Paul of the Cross was located in the first portion of the portico of the basilica.) The Chapel in honor of St Paul of the Cross was begun in 1857 and inaugurated in 1880; the third floor of rooms in the main sector of the building was built in 1933 in order to accommodate the needs of retreatants; the construction, in 1933-1935, of the wing that currently houses the present community refectory and the library above it which also served as the Chapter room. Until 1963 the current retreat house, built shortly after World War II, was the site of the General Curia on the first floor and the second floor was designated for the university/ graduate students. The construction of the wing on the side of the Coliseum in 1961-63 enabled the relocation of the General Curia and the university students to this new site, thus allowing for the former residence to be used exclusively for retreats. The garden of the community is located on a quadrant that was built by Agrippina, the widow the Emperor Claudius, in honor of her late husband, in the midst of which a temple was erected. The Vincentians originally also owned the area where presently the tram passes but which St Paul did not want. In the area of the military hospital until around 1880, the Passionists owned the land that is presently bordered by the Via Claudia and where the block of houses, between the Via Claudia and the Via Celimontana is currently located. In that year the government decided to develop this area of the Celio and it expropriated the land. With the monies from this sale the long section of the wall of “tufo” rock material was built, which can be easily distinguished from the original roman construction. From 1775 until 2000 all the General Chapters took place here, except for those of 1790, 1976, 1802 and 2000. Groups of missionaries departed from this monastery for Bulgaria in 1781 and during subsequent years: in 1840 for Belgium and then England; in 1842 for Australia and in 1852 for the United States of America. Giammaria Cioni, Fondazione dell’Ospizio del SS. Crocifisso, in Bollettino 1926, p. 79-83. Indonesian Passionists lead prayer at the 2006 General Chapter in Rome. Reverendo Padre P. Ottaviano D’Egidio, C.P. His Holiness was pleased to know that the Congregation of the Passion of Jesus Christ is about to celebrate its General Chapter in Rome, from 1 to 21 October of this year. On this special occasion he sends to you and to the participants his best wishes, that are extended to all of this religious Family, with which he shares a long friendship, and by means of which he has come to admire, since the early years of his academic life in Germany, the figure of Saint Paul of the Cross. He hopes that the work of the capitulars is fruitful, a work that is especially dedicated to “restructuring” and to the “revitalization” of the presence of the Passionists in the Church and in the world, to translate the ageless teachings of the Founder into works that are in keeping with the times. This is the message which you are also called to announce in this day and age; this is the heart of your charism, that which inspires the contemplation to which you must dedicate yourselves in the solitude of your retreats, as Paul of the Cross referred to your religious houses, or by creating an analogous space for contemplation in the various situations in which you currently carry out your mission. It concerns a mission that is always valid: i.e. to demonstrate that the Cross is love and that love is God. As your Founder often repeated: from the ocean of the love of the Father flows the ocean of suffering of the Passion of Jesus; from the Heart of the Father comes the Passion of the Heart of Jesus and his Body which is the Church. Your Founder was deeply convinced that the evils of the world derive from forgetting the Passion of Jesus. Consequently, his constant endeavor was to remember the Passion and to invite others to do the same. Union with Christ Crucified became for him the inspiration to be in communion with all people; the passion for justice and for charity. In the mystery of the Cross he found the strength to act and to value self-denial and suffering, always desiring to share in the suffering of the Redeemer for the evils of humanity. In your work of “Restructuring” keep in mind the urgent goal of the unity of the Congregation and each one’s responsibility for its various entities; the search for formation that is always more unified and profound; the exchange of personnel and means of support above all keeping in mind reciprocal support between countries that are economically sound and those that are developing; receptivity to collaboration with the local Churches, with Institutes that are associated with you, with the laity; a consciousness of new forms of poverty and the “crucified” of our time. By employing new means, may your concern be that of manifesting that same love for the Church and the same apostolic zeal for souls that characterized your Founder. Furthermore, the involvement of all the members of your Congregation in reflection on the charism of the Passion, as well as in a search for lifestyles and apostolates that are more authentic and faithful to your origins, cannot do other than inspire within you the desire for a more profound intimacy with Christ. This will keep you from the risk of succumbing to worldly influences and the culture of secularization, which also tries to penetrate the minds and hearts of consecrated religious. In particular, the Holy Father exhorts the cloistered nuns founded by St. Paul of the Cross to renew their fervor in prayer, the offering of themselves and their witness, accepting with docile trust the directives of the competent Authorities of the Holy See toward a modification of their structures in keeping with present day needs. 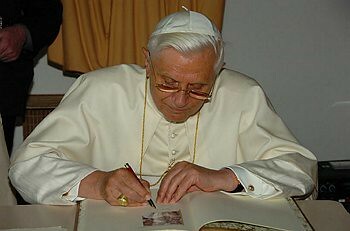 His Holiness Benedict XVI, assuring you of a special remembrance in his prayer, invokes upon the General Chapter the maternal protection of Mary, who from your beginnings has been venerated in her Presentation in the Temple and whom you have subsequently chosen, under the title of “Mother of Sorrows”, as your Patroness, and the heavenly intercession of the Founder and the saints and beati of your Congregation. With these sentiments, he imparts to you, Reverend Father, and to all the Passionist Family the Apostolic Blessing. I also include by sincere best wishes and I take this opportunity to reaffirm my religious esteem.